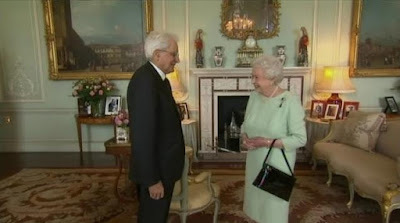 The Queen held audiences at Buckingham Palace, including with the President of Italy, Sergio Matterella. It's a double brooch day! Firstly, dressing to blend in with her wall color, but I can't help but note this is the second appearance in a row where this Cambridge emerald brooch gets to keep its pendant. A promising trend, I hope. The Queen, accompanied by members of the Royal Family, hosted a Garden Party at Buckingham Palace. And secondly, the Rose Gold Brooch,which really needs a strong background color like this to stand out (similar to last year's Maundy Service, though a different outfit). Breaking out the outfit she sported for the Cambridge wedding back in 2011, The Princess Royal appears to have had a whale of a time. She's holding her own in the hardware department, too, with diamond flower earrings, a double strand of pearls, and a pretty big brooch. It's always a bit jarring to see her in something with such added fuss (and in something crafted in recent years), isn't it? Takes a blink or two to realize who you're looking at. Speaking of added fuss...I'm just not sure about this combination of pattern and embellishment, Princess Beatrice. But I can't lie, I covet those shoes and their saucy metallic toes. Like tap shoes with attitude. It's not a fashion accessory, but I am certain that Princess Michael chose an outfit with black trim to coordinate with her new pirate life and you have to love her for making the best of things. (Apparently she had eye surgery last week.) The always well-tailored Prince Michael rounded out the black and white theme with a gray scheme of his own.